Another great read from my LIST of the best sellers of the last 100 years. This one was published in 1920. Set in the years before World War I, a dissolute aristocrat from England apparently kills a man who allegedly attacked him in the woods near his estate. The body of the man is never found, and when the aristocrat returns home covered in blood, his wife goes into some kind of shock and goes crazy. Under this cloud, the aristocrat goes to Africa to spree around and shoot game and generally make a drunken nuisance of himself. After about ten years, he is found, almost dead, by a German operative, a man he went to college with years and years ago. Curiously, they look almost identical, a fact noted back in college days. He is nursed back to health, and the two of them spend a night sharing secret stories of their lives and pasts. Then the German guy must leave on assignment, and the British aristocrat is sent on his way with supplies. But those supplies do not include water or food, only whiskey, meant to kill him. He is found dead, and the German goes to England in his stead, claiming to be the aristocrat. We the Gentle Readers are never quite sure just whose side this German guy is on. The Germans are using him as a spy to keep them posted on the temperature of the British people and provide him with money to recover his estate, pay his debts, and no long be the debouched cad he was. His ‘old’ acquaintances are delighted at this change in him, his deranged wife begins to care for him, but claiming he is a different man, not her husband, the Hungarian princess with whom he (the German count) was having an affair still is desirous of him, but feels he has changed dramatically from the cavalier she once knew who killed her husband in a fight, hence his exile to Africa. War approaches, and we see the struggle of those English who believe war is imminent, and those who believe that the Germans want peace as much as they do, personified in the personage of the aristocrat’s Duchess cousin’s husband, the Duke, and in the personage of a German salesman, a naturalized British citizen, who befriends the guy on the ship home to Britain, and turns out to be his handler. So. Who is alive? Who died in Africa? Did anyone die in Africa? Can a tiger change its stripes. Fun read. Well written, cleverly plotted. 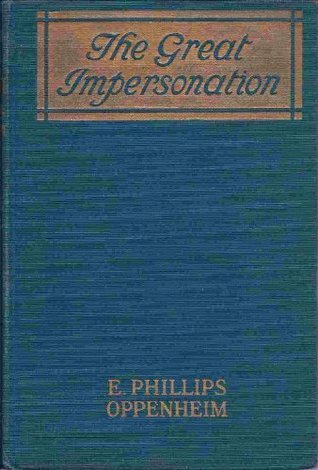 E. Phillips Oppenheim was the author of 116 novels, mainly of the suspense and international intrigue type, but including romances, comedies, and parables of everyday life, and 39 volumes of short stories, all of which earned him vast sums of money. He also wrote five novels under the pseudonymn Anthony Partridge and a volume of autobiography, ‘The Pool of Memory’ in 1939. He is generally regarded as the earliest writer of spy fiction as we know it today, and invented the ‘Rogue Male’ school of adventure thrillers. More than 30 of his works were made into films. Well, dang, you could spend a good many years simply reading his oeuvre. This entry was posted in Fiction, Literary Fiction - That's the High Class Stuff, Thriller.